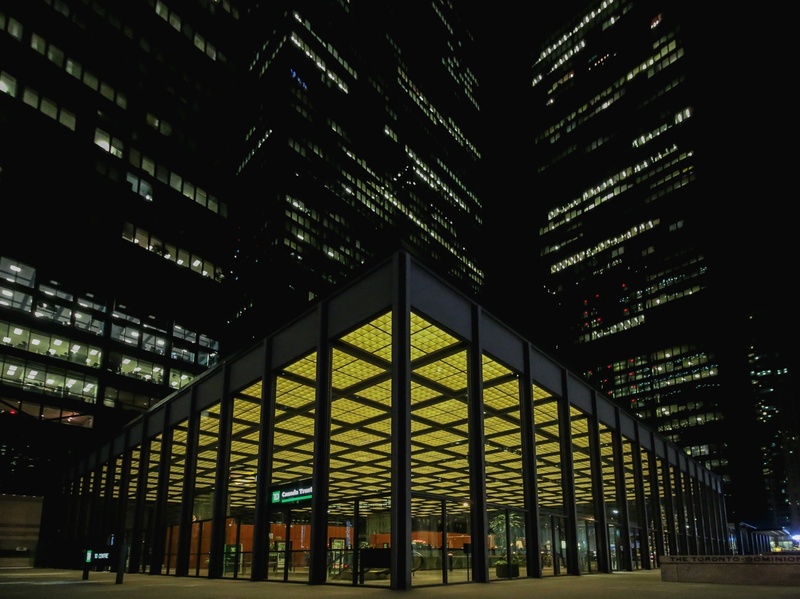 Toronto has its fair share of noteworthy buildings designed by prominent Canadian architects. Its rich architectural heritage is evident in the various styles found throughout the city, from the Victorian-era industrial buildings in the Distillery District, the classic Beaux Arts-style of Union Station and the landmark CN Tower that defines the city skyline. 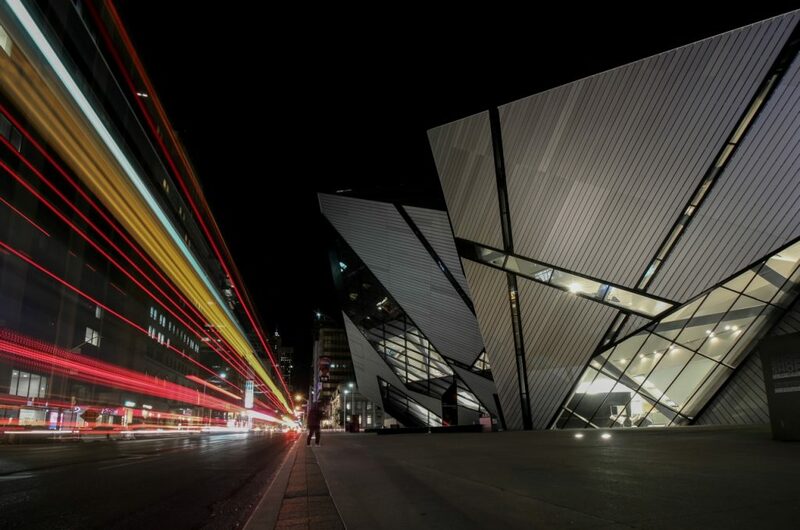 And while many of these buildings were envisioned by talented Canadian architects — Frank Gehry’s dramatic transformation of the Art Gallery of Ontario comes to mind — Toronto is also home to a diverse collection of works by international talents. 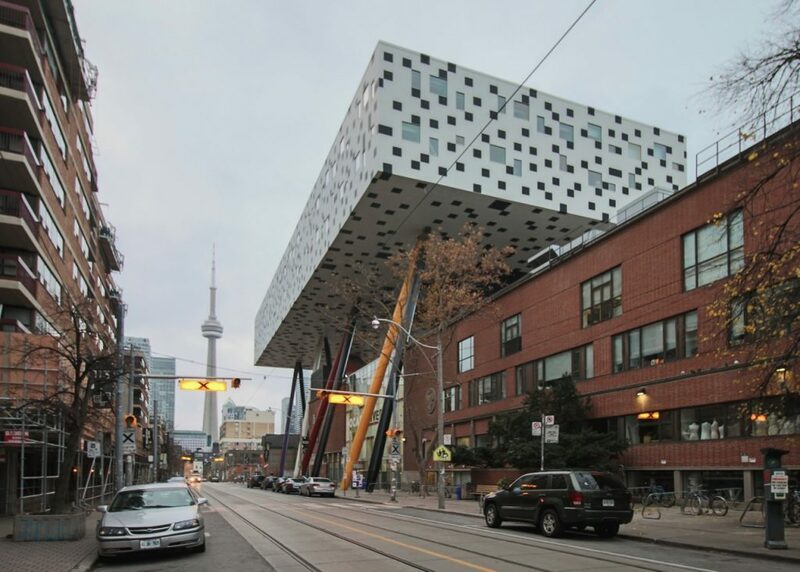 We’ve rounded up a selection the most famous Toronto buildings that were designed by international architects. Check out our photo tour below. 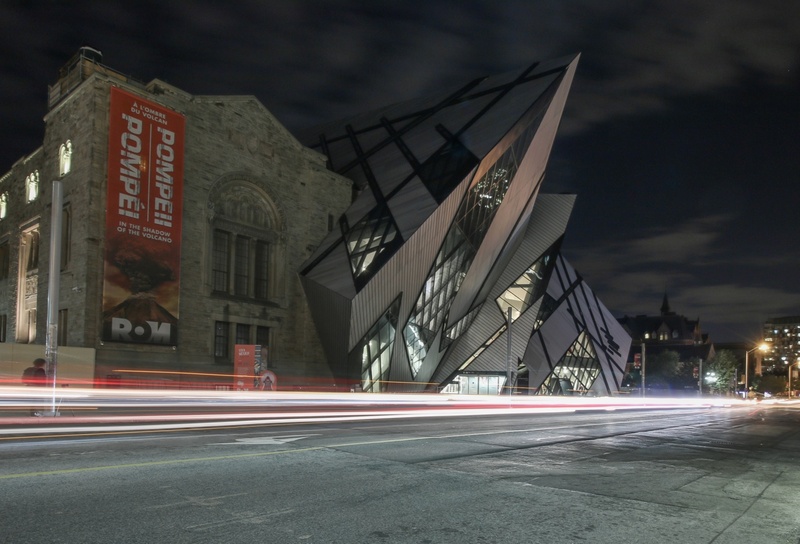 Named for businessman and philanthropist Michael Lee Chin for his $30 million donation, the stunning crystal-like addition to the Royal Ontario Museum was designed by Polish-born, American starchitect Daniel Libeskind. Inspired by the museum’s gem and mineral collection, the extension’s sharp edges and brushed aluminum skin provide a striking juxtaposition to the original structure’s buff-coloured brick and terracotta facade. 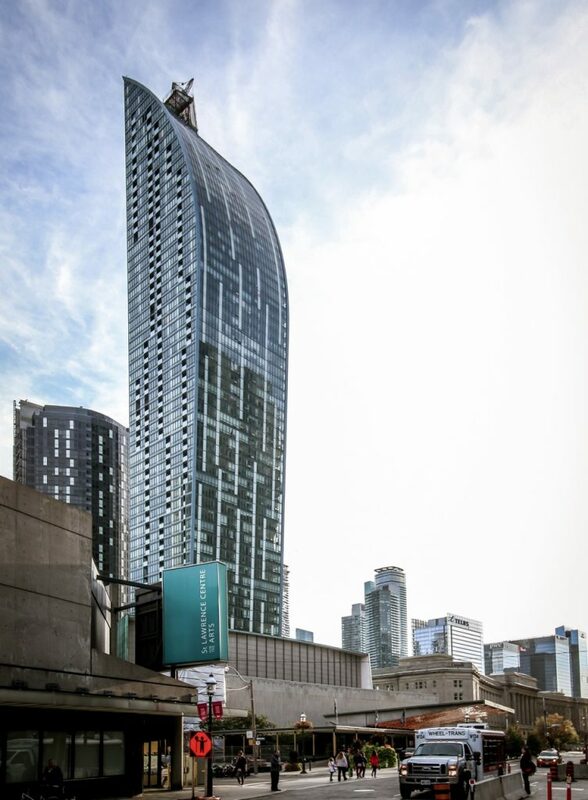 Located at the southeast end of the downtown core, Daniel Libeskind’s second Toronto area project introduced a bold new design to the city’s booming condominium scene. 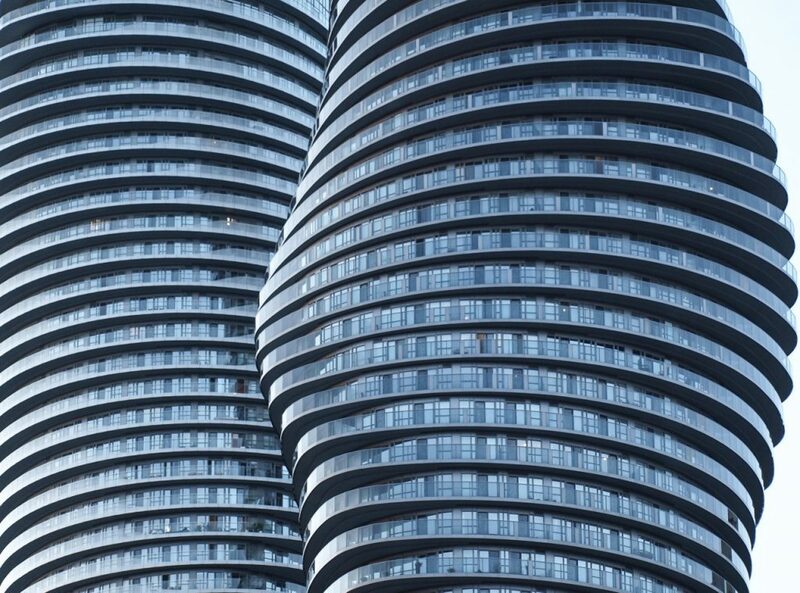 Its slender profile characterized by clean lines and inset balconies rises 58 storeys into the Toronto skyline and boasts a dramatic curved top. The tapered design is not only distinctive but also functional as it prevents shadows from forming over the adjacent Berczy Park. German-born Ludwig Mies van der Rohe was a master of minimalism and a pioneer of the modernist architectural style. 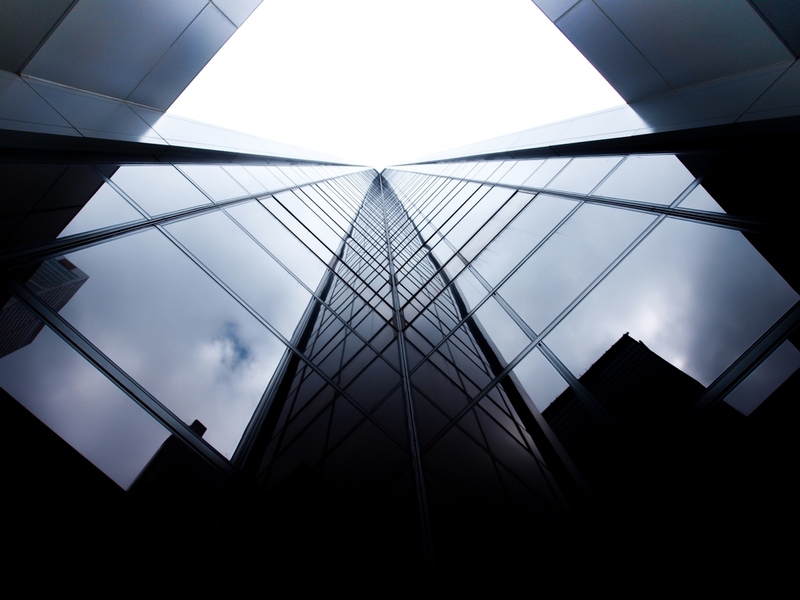 His ‘skin and bones’ design philosophy which emphasized the use of steel structures and glass enclosures proved that simple and uncluttered could be bold and beautiful. The TD Centre in Toronto’s Financial District was one of van der Rohe’s last major works and was a radical departure from existing buildings when it was completed in 1969. 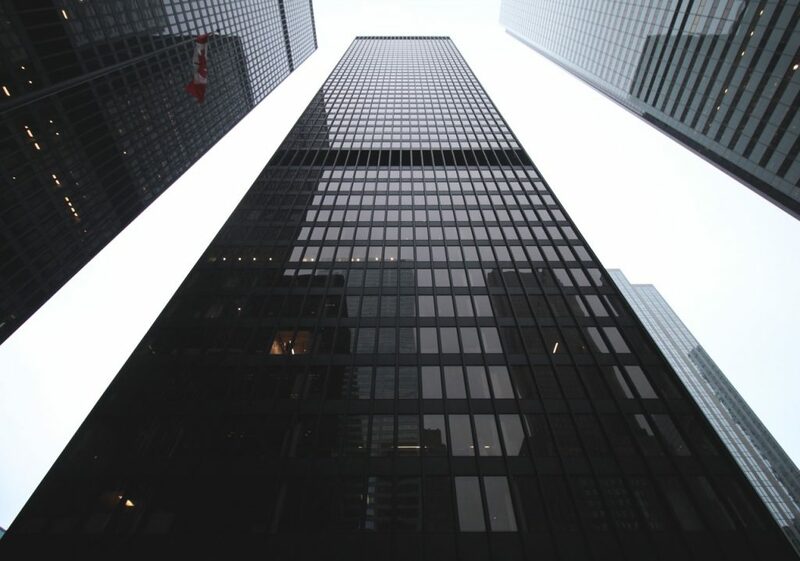 Though lambasted by some for its stark black exterior and bronze tinted glass, the TD Centre remains a fine example of modernist style and its simple, grid-like design has arguably stood the test of time. While the world renowned Louvre Pyramid may be his most famous project, Chinese-born Pritzker Prize-winning architect Ieoh Ming Pei’s shiny glass skyscraper in Toronto is a major component of the city’s downtown core. 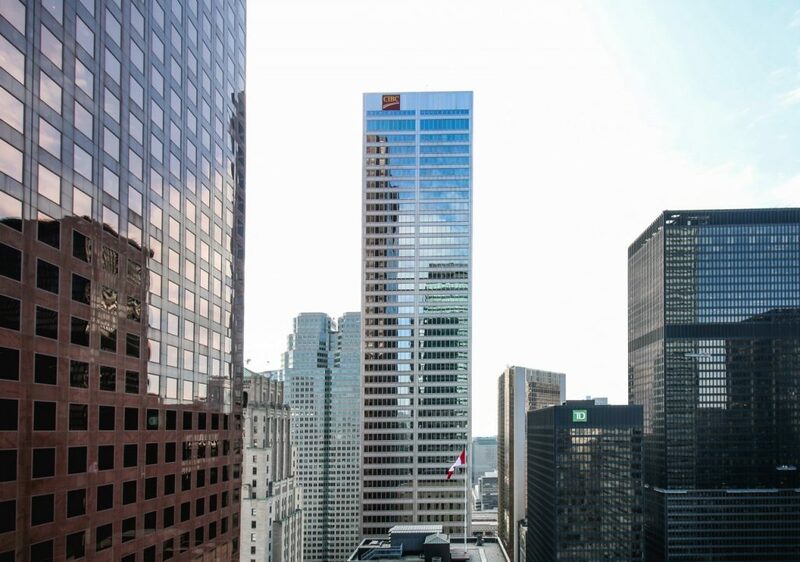 The 57-storey tower is part of a four acre, four-building complex on the southeast corner of Bay Street and King Street West that includes a 1930s-era Beaux Arts building. 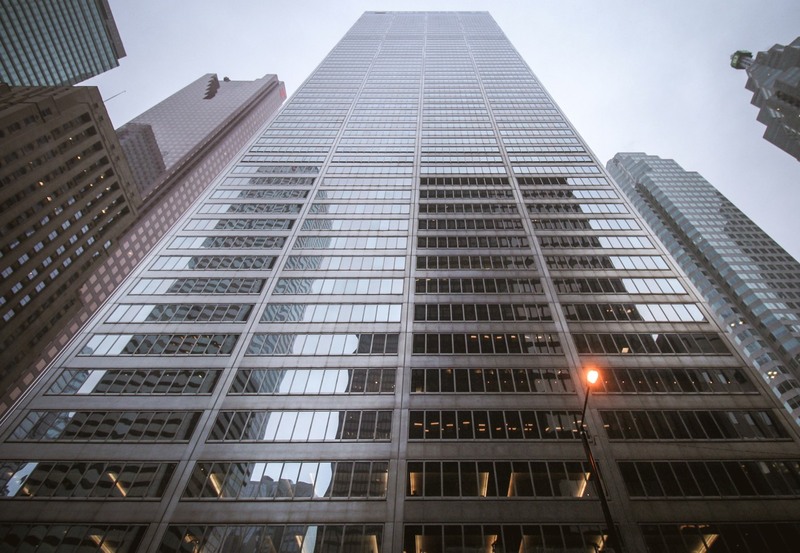 Its exterior is covered with a glimmering stainless steel skin that contrasts with the adjacent black towers of the TD Centre, but echoes their modernist shape and functional floorplates. Designing an addition to an educational institution dedicated to art and design can be a challenge. Stick with the status quo and risk being called boring, or stray from the norm and risk being controversial. 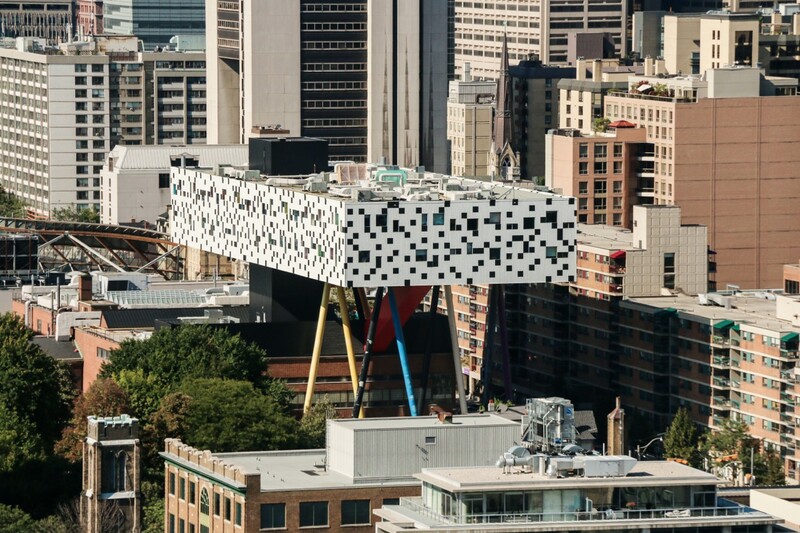 When designing the Sharp Centre for Design, English architect Will Alsop opted for the latter. His bold, table-like design was built atop the existing structure and is supported by 12 brightly-coloured, angled steel columns. 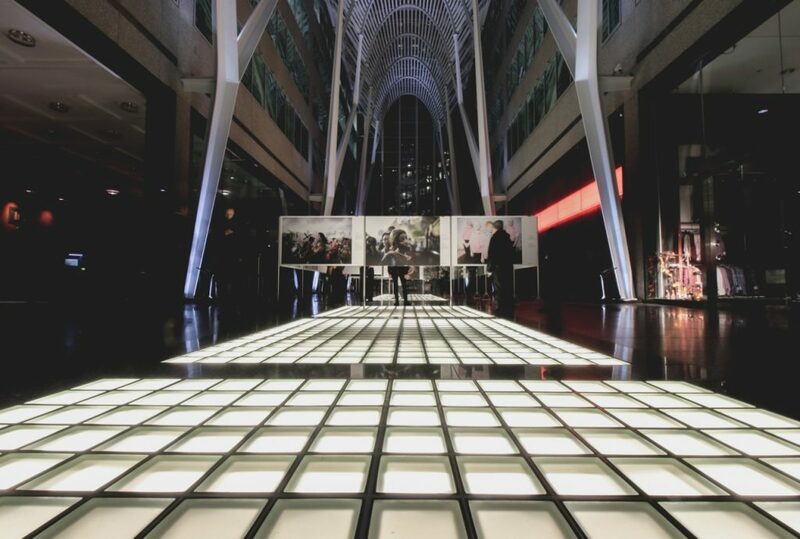 Although it’s not exactly a building, there’s no denying that the Allen Lambert Galleria is a bonafide Toronto landmark — just search ‘brookfieldplace’ on Instagram. 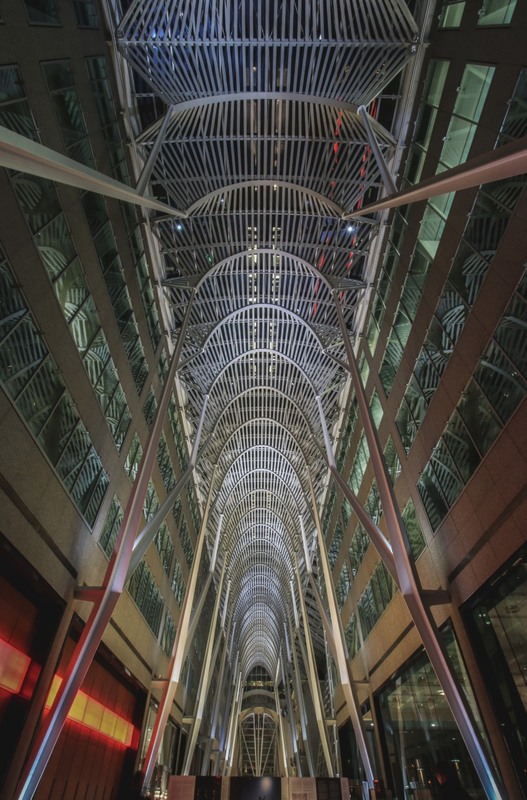 Situated inside Bay Street’s Brookfield Place commercial complex, the block-long atrium was designed by Spanish architect Santiago Calatrava. The structure consists of expansive steel arches creating a forest-like canopy over the pedestrian walkway. Calatrava also designed The Oculus at the World Trade Center in New York City which similarly uses white steel beams to create a visually stunning atrium over the transit hub’s promenade. Home to beautiful examples of Romanesque and Gothic Revival styles, the University of Toronto’s downtown campus is filled with notable examples of architecture. Mixed in with the 19th and early 20th century era buildings is the school’s Leslie Dan Faculty of Pharmacy. Designed by renowned English architect Norman Foster, the state-of-the-art teaching facility’s most famous feature is its five-storey open atrium with two orb shaped pods used as study lounges and work spaces. Sci-fi fans may also recognize them from the 2010 film Resident Evil: Afterlife where they were used as the setting for Umbrella Corporation’s underground headquarters. 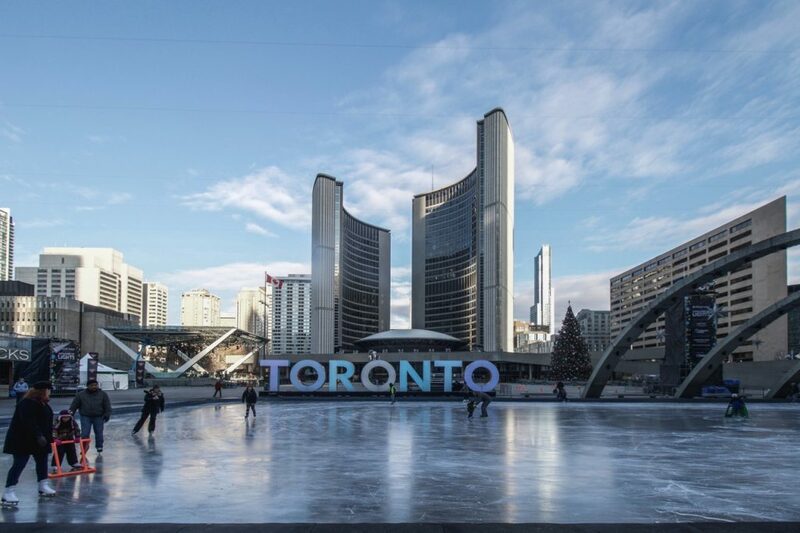 Named in honour of Toronto’s 52nd mayor, Nathan Phillips Square is the city’s central gathering spot for major events and celebrations. The 12 acre site includes a permanent concert stage, a reflecting pool/skating rink, and the two City Hall towers designed by Finnish architect Viljo Revell. 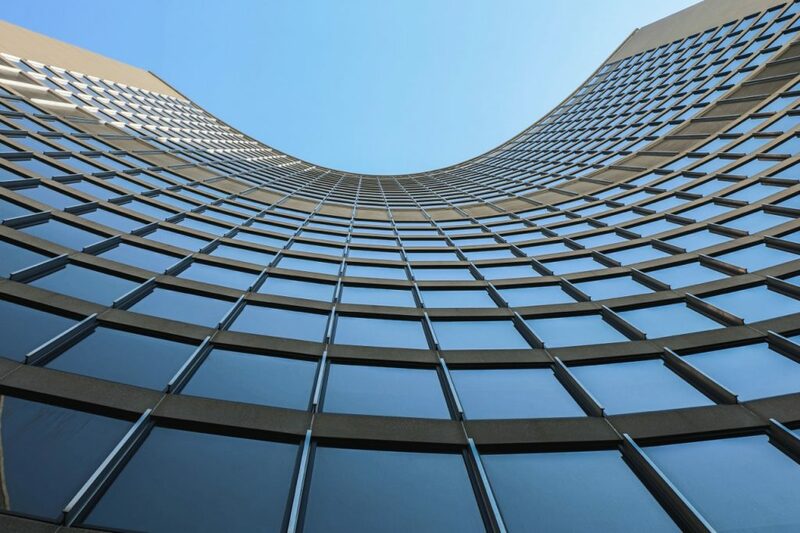 Comprised of a 27 storey east tower, 20 storey west tower, and a central Council Chamber, the futuristic, curved concrete design was chosen as the winner of an international competition held in 1957 by then Mayor Nathan Phillips. 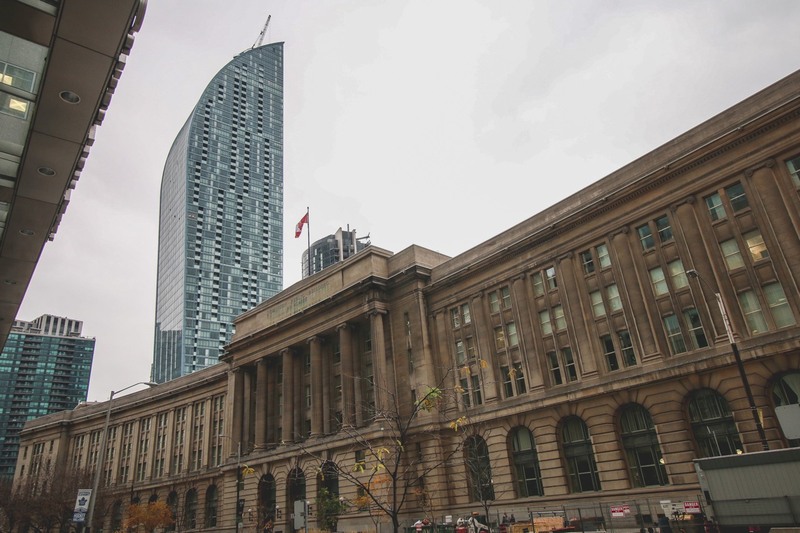 Like the Leslie Dan Faculty of Pharmacy, Toronto’s City Hall was a popular location for the Resident Evil franchise, but suffered a sadder fate after being blown up in Resident Evil: Apocalypse. 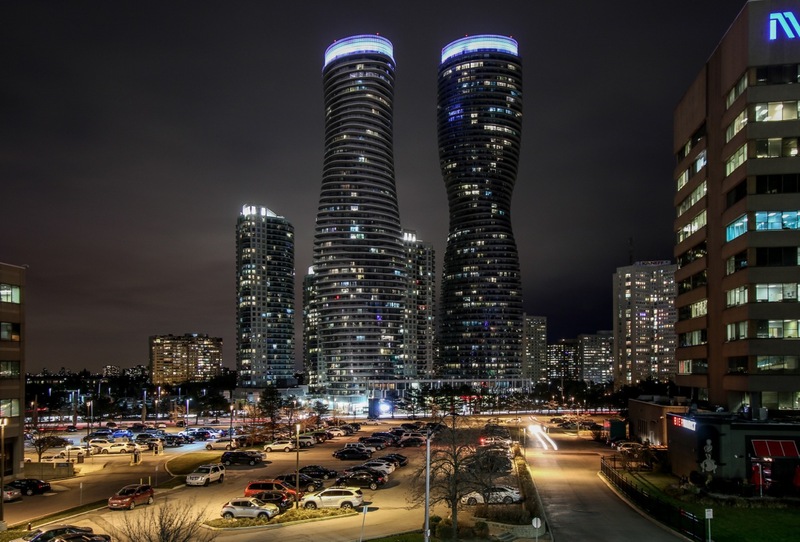 While the Absolute World towers are actually located 30 minutes west of Toronto in the neighbouring city of Mississauga, we just had to include them in our list. They were, after all, voted best international residence building by ArchDaily readers in 2012 and recognized as the ‘Best Tall Building in the Americas’ by the Council on Tall Buildings and Urban Habitat (CTBUH). Known as the Marilyn Monroe towers by locals, the Beijing-based architect’s unique design with voluptuous curves are easily identifiable from miles away and has helped put the city on the international stage. 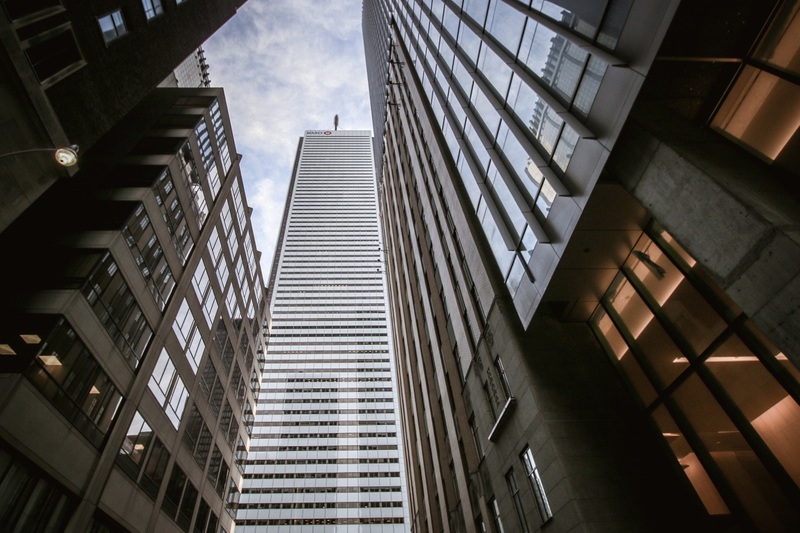 Built in 1975 by American architect Edward Durell Stone, the 72-storey, white marble-clad office building is the country’s tallest tower — outside of the CN Tower — and remains a fixture in Toronto’s skyline. 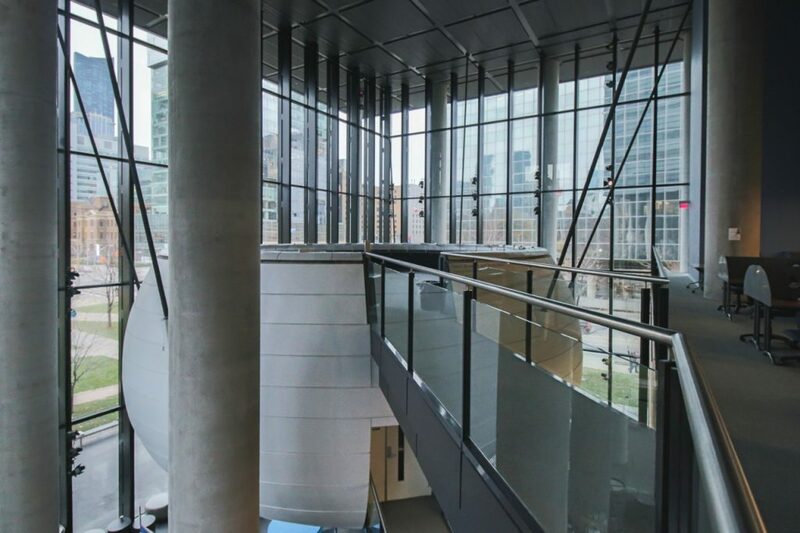 In 2012, the iconic building underwent a major renovation that involved a total recladding of its exterior facade after one of the marble panels fell off and landed on a mezzanine roof below. 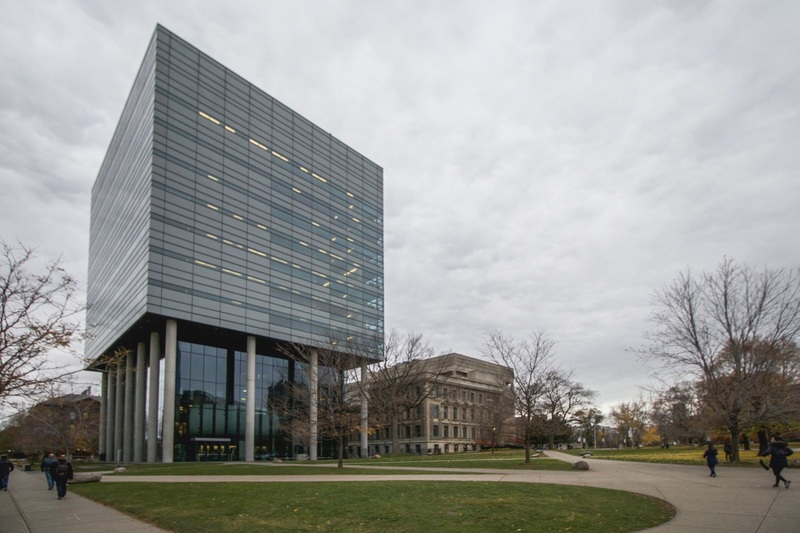 The renovations resulted in the replacement of 45,000 marble panels with 375,000 square feet of glass spandrel with a white ceramic frit. Ironically, Chicago’s AON Tower — a similar looking building by the same architect — also underwent a major exterior refacing after a marble slab fell off its facade decades earlier. 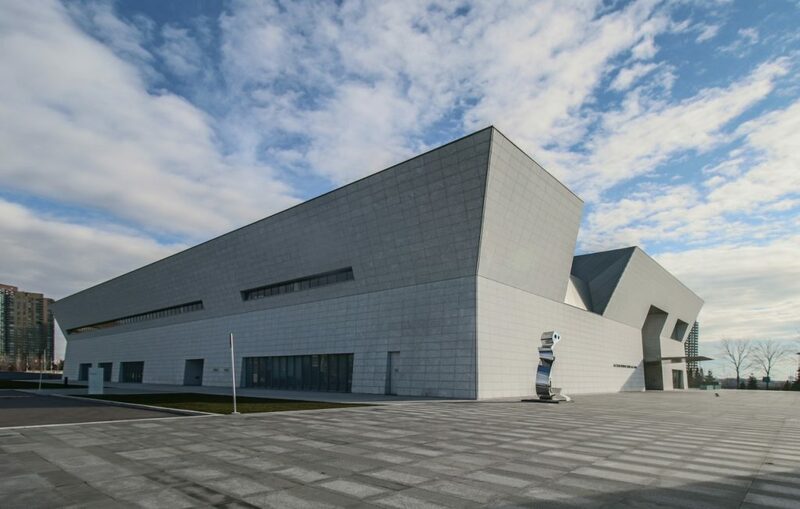 Japanese Pritzker Prize-winning Fumihiko Maki’s Aga Khan Museum is one of Toronto’s newest architectural gem. Completed in 2014, the Brazilian granite-clad museum was built to house a permanent collection of over 1,000 objects and artefacts of Muslim history and culture. 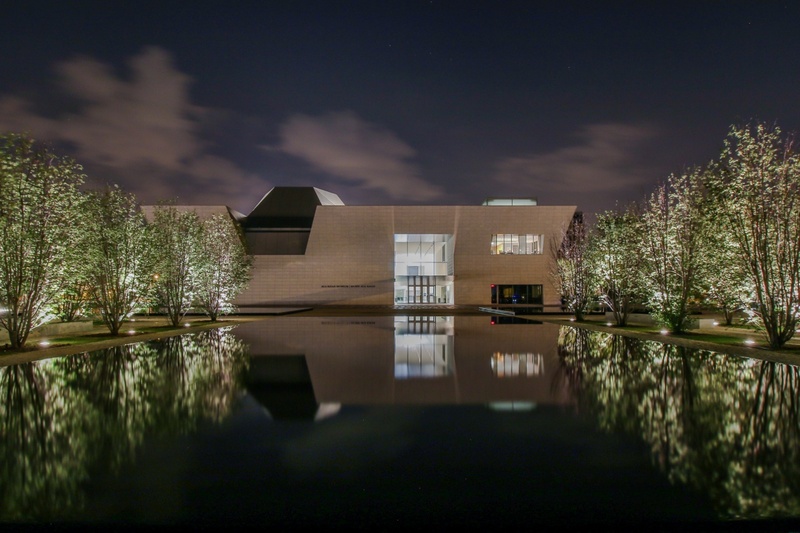 Outside, the building’s soft white facade is accented by manicured lawns designed by landscape architect Vladimir Djurovic featuring rows of serviceberry trees and black reflecting pools that mirror its elegant shapes and lines.